As a kid and teenager I wrote to make sense of the world around me, of my fears, dreams and thoughts. Now it’s still basically the same. Maybe there are two types of writers, at least in the field of children and young adult literature. The ones who write remembering who they were and the ones who write for the kids and teens who are not heard. Great post, Mona. I love what you said Evelyne: “The ones who write remembering who they were and the ones who write for the kids and teens who are not heard.” I think most writers write both. I have been waiting for someone to ask me this, Mona, since I was sucking my thumb. I wait on street corners waiting for someone to ask me this. Now you have. I will reply as soon as I can. Let me slam down a couple of Death In The Afternoon tragos. Wait right here in front of your monitor, Mona. 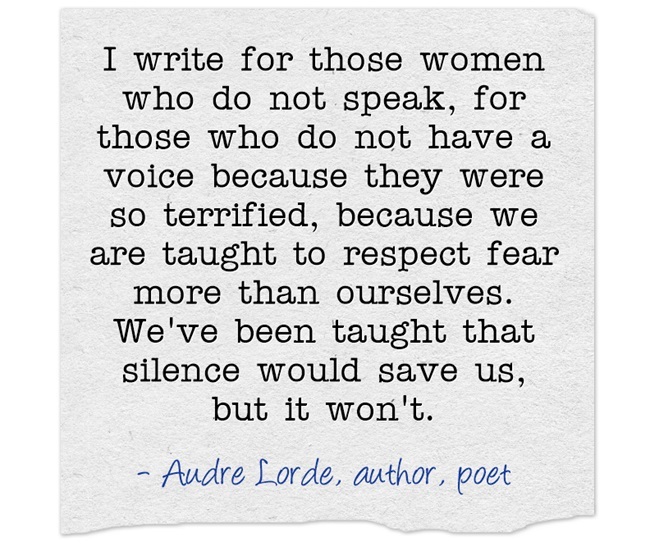 I love this post – women are so often encouraged into silence. As a child I was taught that children were ‘seen and not heard’. I think I started to write because I felt alone and like an outsider, but I also write because I have to – it’s a compulsion. YES! writing because of feelings of isolation is some of the best writing. Thank you for sharing, Andrea. Okay. I’m seven months late, but I just met you 🙂 I write because I was voiceless for so long that I feel I owe it to myself to use my gifts and talents, finally. I write because sometimes I used my voice and wit but for all the wrong reasons, and now I owe it to myself to use my gifts and talents for good. Thanks for the follow and glad to meet you: https://kwoted.wordpress.com Great post and great quote – think I’ll start Women’s History month with this one.